Social media marketing companies for realtors automate content selection and posting for social media. We looked at the most popular options and rising stars and decided to review Cityblast, Roar Solutions, and Circlepix. These companies covered the range of options for Realtors in terms of pricing and features. Read on for our comparison and review of these three options, as well as our top recommendations. We chose Cityblast as the best social media marketing company for Realtors because of their locally targeted content, the ability to choose content categories and review content before posting, and their relatively affordable price for up to seven postings per week. Learn More Yes. Can choose multiple categories to customize postings and review content before posting. You can choose a mix of content categories to post, but can’t review content before posting. Yes. Can choose from 15 categories to customize postings and review content before posting. Learn More Yes. Likes, shares, comments on dashboard No Yes. Likes, shares, comments on dashboard. Learn More Lead generation services Account Staging: Setting up and designing social accounts Listing photography, general marketing services. Cityblast was the only company we reviewed that offers local content like market reports for no extra charge. Since being a local expert is crucial to success as a Realtor today, this puts them a step above Roar Solutions and Circlepix. Cityblast is the only social media service that allows agents to review content before posting via their handy dashboard. Realtors are presented with a calendar showing which postings are scheduled for each date. They can then pick and choose which articles to post or which not to post. While Cityblast came in at $99 per month without paying the year in full, they offer up to seven postings per week for that price which is on par with the $95 per month Roar Solutions charges for also seven postings. However, if you opt to pay the entire year up front, then Cityblast becomes the best value at just $59 per month for 7 posts/week. Again, Roar charges $95 per month for the same amount of content and Circlepix charges $42 for only 4 postings per week. Roar Solutions was the only company to offer fully customized content creation for Realtors. In other words, they’re the only ones that write articles, make infographics etc. However, it should be noted that their pricing for customized content is a little bit steep. They charge $195 for two hours per month of custom content creation and $395 per month for five hours of custom content creation. However, you do get a dedicated social media manager for that price so if you want a truly turnkey social media posting service and have a few dollars to spare, then Roar should be your first choice. While they only offer four postings per week, Circlepix beats Cityblast and Roar Solutions in one key area: pricing. At just $42 per month when paid yearly, Circlepix was far and away the most affordable option we found. If you’re on a tight budget but still want to give your social media a boost, then Circlepix is an easy choice. What are Social Media Marketing Companies? While almost every real estate blog or coach recommends social media as a great lead generator, many Realtors simply don’t have the time or skills to manage their own social media. Social media management companies fill this niche by offering to create and source content, and post it directly on Realtors’ social media profiles for them. 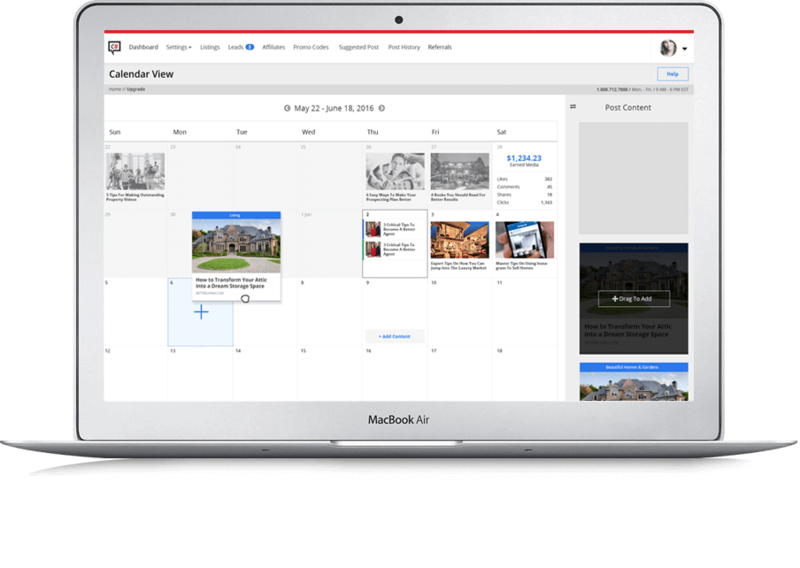 Ideally, this lets Realtors reap the benefits of social media without taking the time out of their busy schedules to research, write and schedule posts. Let’s face it, while sourcing writing and posting your own content on social media can be a productivity killer, it’s not exactly expensive. After all, social media accounts are free, and social media tools like Hootsuite, Buffer, and Feedly make finding and posting content pretty easy and affordable. Most Realtors can get away with using free versions of this software with great results. That means that in order for them to be effective, social media marketing companies need to be affordable. Unlike something like say, transaction management software, this service is something of a luxury rather than a necessity. Here’s how the three companies stacked up for pricing. CityBlast: Cityblast comes at a fairly reasonable $59 per month when paid annually, but bumps up to $99 per month when paid monthly, or $75.99 per month when paid biannually. At $59 per month I feel like Cityblast can be easily justified. After all, it will only take one deal to recoup your year of service. That said, if you have a target audience that is not engaged online, or don’t have a decent following built up yet, $99 per month seems very steep for what amounts to essentially choosing articles and posting them for you. Even at $59 per month when paid annually, Cityblast is still slightly more expensive than either Roar or Circlepix. However, since it is the only service to offer local content, and offers daily posting, up to seven posts per week, we think Cityblast is worth the slightly higher cost. Roar Solutions: Roar Solutions came in at $55 per month with no discount for paying the year up front. While this is comparable to Cityblast, Roar offers a bit less in the way of services and features. Paying an extra $5 per month for Cityblast to get local content seems like a no brainer for us. That said, Roar also offers custom created and local content for an extra fee. They charge $95 per month for two hours of custom content creation/sourcing, or $395 for five hours of custom content creation. At this tier you also get your own social media manager who will help you decide what content will work best for your brand. Circlepix: As far as pricing goes, Circlepix beats the other two social media marketing company for Realtors hands down. They charge either $42 per month when paying the full year upfront, or $49 per month when paying on a monthly basis. This makes Circlepix the most affordable option. If price is a major concern and you want to handle local content on your own, Circlepix might be the way to go. Even a few short years ago, the only social media platform that mattered for Realtors (or most small businesses for that matter) was Facebook. Today with Facebook making it harder to get your small business posts to succeed, this is no longer the case. As the social media landscape for Realtors changes, social media marketing companies are going to have to adapt along with it. Here are the social media platforms the three companies are offering for 2017. 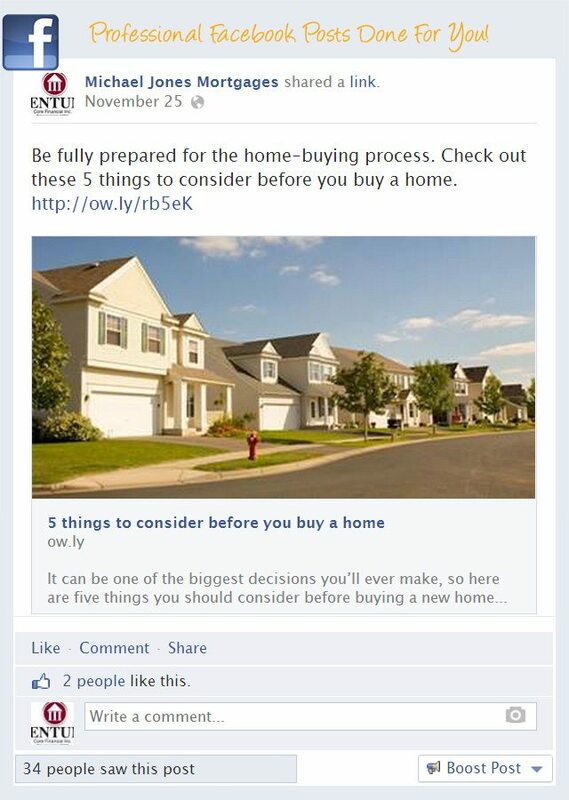 CityBlast: Cityblast currently posts content for Realtors on Facebook, Twitter, and Linkedin. For many Realtors this is all they’ll ever need. Roar Solutions: Like Cityblast, Roar Solutions posts content for Realtors on Facebook, Twitter, and Linkedin. However they also add Google+ to the mix. While Google+ isn’t exactly the most popular platform, posting on Google+ can help your website rank higher on Google if you link to it from your profile. Circlepix: Like the other two companies Circlepix posts content for Realtors on Facebook, Twitter and Linkedin. Like all your marketing efforts, your social media posting needs to be local in order to attract leads you can work with. After all, what good is being popular in Los Angeles if you work in New York City? In order to address this issue, social media marketing companies offer Realtor’s targeted content. This means content that is geared toward your local audience, and/or targeting buyer or seller leads specifically. CityBlast: We were surprised to find that Cityblast was the only company to offer local content on the state and city level. They also offer content in 15 other categories that Realtors can pick and choose from to customize the feed of posts from Cityblast. This means you can laser target the content they post to attract the right leads. Trying to get more listings and avoid buyer leads? You can tweak your feed to have more content targeting sellers. Categories include buyer advice, seller advice, home and garden projects, investment advice, budget advice and more. Roar Solutions: Roar allows Realtors to pick content from several different categories to target buyer or seller leads. They do offer local content, but charge an additional fee for it. Circlepix: While Circlepix also offers content in 15 different categories, they don’t really offer content tailored for your local market. One of the common misconceptions about posting to social media is that you need to either write all the content you post, or only repost articles from other sources. In reality, both can help your brand. While timely and engaging content shared from other sources is great, and often produced at level that is very difficult for non professional writers, it lacks personality and can seem a bit detached. Instead, posting a mix of personally produced content, even something as simple a holiday greeting, with say, great viral articles from other sources will get you the best results. One caveat; you can and should still occasionally chime in with your own personally produced social media content. It will help your account feel more personal. CityBlast: While Cityblast writes the headlines, and some quick body copy, they do not create their own articles, infographics, list posts etc. Instead, they post content from a variety of online sources. An example of Facebook content posted by RoarSolutions. Circlepix: Like Cityblast and Roar, Circlepix writes the headlines and some quick body copy, but doesn’t create their own articles, infographics, or other content. As a Realtor you should not only know your audience, but should also have some idea of the content they would like to see. All three companies give agents the chance to choose from a variety of content categories, including buyer and seller targeted content, home improvement, mortgage news, etc. Reviewing content before it gets posted can also be helpful. You may want to avoid posting content from certain websites, or might even know of articles that do a better job telling the story. CityBlast: Cityblast allows agents to choose from 15 different content categories including city living, investment advice, celebrity homes, tips and guides for sellers, local real estate news and more. Agents can also review articles before posting to their social media accounts. Here’s what Cityblast’s calendar view of their social media dashboard looks like. Note you can clearly and easily see what’s being posted and can remove or reorder postings. Roar Solutions: Roar offers agents the ability to choose between a wide variety of content categories. However, unlike with Cityblast, agents cannot review articles before they’re posted. Circlepix: Circlepix allows Realtors to choose between 15 categories including DIY articles, buying and selling tips, mortgage, housing market, interior design and more. Agents can review articles to be posted from their dashboard. You can remove posts you don’t like coming up in your calendar by refreshing the category list. Customizing posting frequency is important for social media success as well. After all, you don’t want to overwhelm your audience with too many posts, but during the slow season you may need to increase your posting frequency to get more leads. Here’s how the three social media services stacked up for customization of posting frequency. Important note: one “posting” is equivalent to one article posted to all three (or four) of your social media accounts simultaneously. CityBlast: Cityblast allows agents to customize their posting frequency up to seven postings per week. Roar Solutions: Roar does not allow agents to customize their posting frequency, but posts an average of three times per week for their basic plan, and seven times a week for their advanced plan. Circlepix: Circlepix allows agents to customize their posting frequency up to four postings per week. Being able to track the effectiveness of your social media campaigns is crucial for determining your ROI. While you can and should have your social media accounts set up to send you updates for new comments, likes, etc. via email, having this all in one place can be helpful as well. Here’s how the three social media marketing companies for Realtors handle reporting/analytics. CityBlast: Cityblast allows agents to view likes, shares and comments on their dashboard. This means you can assess your effectiveness across multiple social media platforms in one place. Pretty handy. Roar Solutions: Roar Solutions does not offer any reporting or analytics to track the success of your social media postings. Circlepix: Like Cityblast, Circlepix allows agents to view likes, shares and comments on their dashboard. One of the biggest risks in real estate marketing is committing to a long contract to a service you’re not convinced will offer a great ROI in your area. Luckily, all three companies allow Realtors to use their services on a month-to-month basis. CityBlast: Cityblast does not require a contract, but they do discount their pricing if you pay for the entire year up front. In order to try out their services, start out with a month to month plan. If you get more likes, followers or leads, then you can pay for another year in advance since you know you can get a decent ROI. Roar Solutions: Like Cityblast, Roar Solutions does not require a contract. However, unlike Cityblast, they do not offer a discount for paying for the year up front. Circlepix: Like Cityblast Circlepix does not require a contract, but does offer discounts for paying for the year up front. If you liked their social media marketing, then you might want to consider using these companies for their other digital marketing services. Here are the other services they offer. CityBlast: In addition to social media marketing services, Cityblast also offers Realtors lead generation services. Plans on offer are $299 per month for 5-6 seller leads per month guaranteed, $349 per month for 7-9 seller leads guaranteed, and $399 per month for 10-13 seller lead guaranteed. That comes out to a little more than $30 per lead which is pretty decent. Roar Solutions: In addition to their advanced social media tiers where they offer custom local content, Roar Solutions also offers account staging, where they will custom design your Facebook, Twitter, and LinkedIn accounts. It costs $95 for one account, or $195 for three accounts. As a company they also offer web design, email marketing, search engine optimization and more. Circlepix: In addition to social media marketing services for Realtors, Circlepix also offers listing photography and general marketing services. RIS Media ACE Content from real estate publisher RIS Media custom branded for your social media channels. Cityblast was our top choice for social media marketing company for Realtors because they offer locally targeted content, with the ability to review postings at a relatively affordable price. Roar Solutions got our pick as the most customizable, and Circlepix as the most affordable. Before committing to any software, try them out for a month to see if they work for your business. I was so disappointed when I had City Blast. They tell you the content will be unique it is not. Whenever something was posted, 3 or 4 other agents in my market area had the same content posted. Information in the postings was inaccurate. Terrible experience. Trying to get someone to return a call from there–good luck with that! Thanks for your review here. Having the exact same content as someone else in your farm area isn’t great. I would think it would be very expensive to get totally unique content though. Have you tried any other services? YOur salesman sounds so scripted… no way would I buy from this company. He could not answer a simple question about where he gets the IDX feed. I think you might be on the wrong site…We just review real estate software, we don’t sell it. Which company are you trying to get in touch with? BEWARE!! Cityblast will tell you whatever they need to get you to sign up then charge you afterwards…no matter what happens Cityblast will not refund your money. BEWARE! Thanks for your comment. We appreciate hearing from users of the software and services we write about on the site. That said, Citblast does not require contracts for their services. Why were you looking for a refund? were you unhappy with the content they provided for your site?